I loved The Story Keeper by Lisa Wingate. An incredible author already, Ms. Wingate, again touches the heart and soul of the reader with this intriguing tale of mystery and family dynamics. 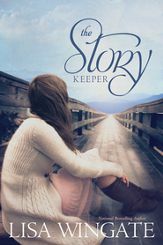 In The Story Keeper, Jen Gibbs, a young editor at Vida House Publishing, receives a 20 year old story under mysterious circumstances. As much as she doesn’t want to participate in reading the manuscript, the story draws her into the world of a young man named Rand and a Melungeon girl named Sarra. What at first seems like the forbidden fruit eventually becomes a mission to find the writer and obtain the rest of the story. Jen takes professional risks by pursuing the manuscript’s author. On a hunch, she travels to the author’s home which also happens to be near Jen’s hometown. Jen had thought she left the town and her family behind along with all of the brokenness it represented, but this quest will take her back to that very place. Evan Hall was a young successful writer when his books swept the nation. Now, his home is a fortress to keep the “crazies” out. But his young niece befriends Jen quickly and he’s helpless to stop it. He finds himself being drawn out from the self-imposing prison and discovering a part of his past that he thought was long gone. The Story Keeper is a journey into the past where a people forgotten by time and horribly persecuted, created history with their lives. It is also a journey into rediscovering past hopes and healing family sorrows. Without a doubt, The Story Keeper will have the reader enveloped into its amazing account. I received this book from the Book Club Network and Tyndale House Publishers in exchange for my honest opinion which I’ve provided here.